The PowerShot SX500 IS features a 30x optical zoom lens, making it the world's smallest 30x optical zoom camera. Meanwhile the PowerShot SX160 IS includes a 16x optical zoom lens. The 30x zoom lens of the SX500 has a focal length equivalence of 24mm at the widest angle, and has been newly developed. The 16x SX160 lens starts at 28mm at the wide angle. Canon has also included ZoomPlus technology to digitally extend the zoom power of the cameras. This boosts the 30x to double the length, making up to 60x on the PowerShot SX500 IS and up to 32x on the SX160 IS. Zoom Framing Assist is also included for use when using the full reach of the zoom, letting you zoom out at the touch of a button and relocate the subject, before zooming back in as the shutter button is released to take the shot. 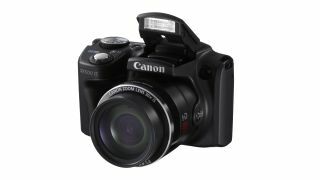 Both of the new cameras feature Canon's advanced optical Image Stabilizer and Intelligent IS technologies. Intelligent IS automatically selects the correct Image Stabilizer mode from seven different settings to match the subject and shooting situation, from close-ups to full-zooms. A new 16 million pixel sensor is included in both cameras, along with Canon's Digic 4 image processor. Advanced Subject Detection technology is capable of choosing between 32 different scenes, while Smart Auto analyses the scene and automatically changes the camera's settings. Full manual control is also included for those who want to be a bit more creative. A range of Creative Filters is also available, which transform images and movies with one of six different effects including Fish-eye and Toy Camera. A 3 inch LCD screen can be found on the back of both cameras, while Full HD video recording is accessible via a dedicated button. The Canon PowerShot SX500 price will be around £279 / (approx $439) while the Canon PowerShot SX160 IS price will be £159 (approx $250). The SX500 will be available from August andPowerShot the SX160 will be available from September.